Staffing agencies are used by organizations to recruit candidates for a wide variety of employment needs. Whenever any vacancy arises, companies send job descriptions to the staffing agencies. The staffing agency needs to find a candidate whose skills match those mentioned in the job description. Once this matching is done the staffing agency needs to thoroughly screen the candidate. Once found suitable the candidate is hired by the staffing agency, not the employer. The salary will be issued by the staffing agency, but the length of employment will be determined by the employer. The jobs offered by the staffing agencies are either temporary positions or permanent positions. In case it is a permanent position the staffing agency works like a recruiter and the employees are then hired by the employer directly. The initial interview is normally a telephonic interview followed by a face-to-face interview. The process may include written tests to check aptitude, skills and knowledge. What are Employers saying about Staffing Companies? If one studies the feedback of various IT companies towards staffing agencies, one finds a common thread. They all feel that screening is not adequate. Their claims are very high, but the delivery is very poor. After the JD is submitted a large number of resumes are sent back which are supposed to be pre-screened. Hoping that one out of the many resumes will fit. This leaves the HR managers disappointed and the onus falls on them to conduct the entire pre-employment testing including programming, aptitude and communication tests. Online Pre-Employment testing will help staffing agencies, who do not have an adequate screening process to satisfy their clients. A] Quality questions: Content development in various disciplines is not a typical strength of staffing agencies. Pre-Employment tests come with ready to use tests with quality questions for various skills and job roles which ensure that candidates will be screened thoroughly. These questions become obsolete and need to be reviewed on a regular basis which again is not feasible for a staffing agency. B] The resumes will never tell the real story: Many a time the resumes make exaggerated claims. Without a rigorous testing methodology is in place, the chances of a wrong hire are very high. C] Recruiters cannot conduct technical interviews: It is not possible for recruiters to assess or screen a candidate's technical knowledge as they may not have the technical expertise. D] An interview cannot reveal all relevant skills and knowledge: A telephonic or face-to-face interview cannot replace a well-balanced test assessing skills, knowledge and aptitude. The initial round screening should ideally be a test followed by an interview. F] Eliminate hiring errors: A bad hire can be very costly for an employer and can damage the reputation of a staffing company. There is a lot of time, efforts and hassles involved in screening resumes, scheduling interviews, organizing test, etc, whenever any screening process is to be undertaken. With online pre-employment testing, these hassles disappear, saving time and money. Moreover, the productivity increases multi-fold. 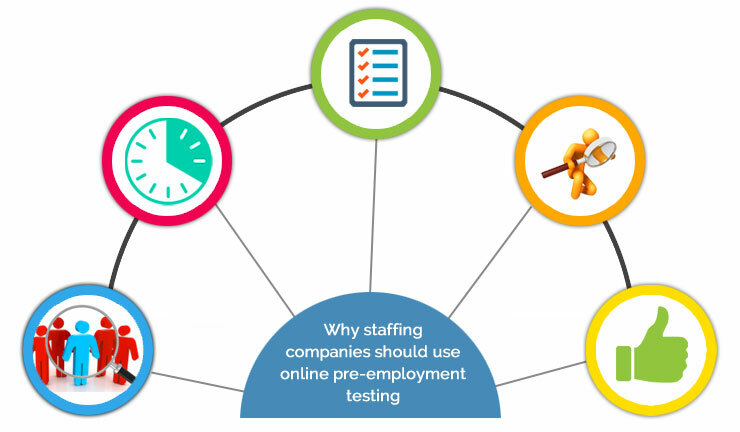 An online pre-employment testing platform can be integrated with a staffing agency’s website allowing various job seekers to submit their details and appear for relevant assessments. This will be done automatically by the system without any manual intervention. This creates a large pool of screened candidates who can be called whenever a vacancy matching their skills arises. Based on the job description staffing agencies need to find suitable candidates. Using online pre-employment testing, tests can be created which are able to assess for specific skills expected by the client. If the client wants a sales manager to manage a sales team in a vast region where he will need to depend on reports rather than physical meetings. He needs to be assessed on his training skills, motivating skills and ability to create relevant and detailed reports. If the client wants a project manager who will have to work on projects with a very senior technical team, he needs to be assessed on his technical skills and team management skills. The ready to use tests by online testing companies as well as the facility to create custom tests makes the job of assessing for very specific skills most feasible. Ensure ‘best-match’ candidates by identifying your candidate's absolute strengths and weaknesses at job task level. Use of a pre-employment tool that ensures quality screening of job applicants. When an employer knows that a staffing agency is using a quality screening process, they would naturally perceive them as a quality staffing agency that they would like to associate with.